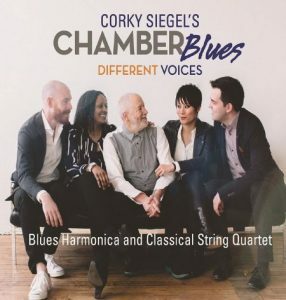 In a world where artists from other disciplines have tended to consider blues a poor, undisciplined stepchild even though it gave birth to all Western music forms, Chicago-born harmonica master Corky Siegel has done his best to change that view. And this beautifully conceived and executed CD, recorded with a four-piece classical string quartet and musicians from the blues, jazz, folk, rap and indie world go a long way in carrying that message forward. Born in the Windy City during World War II, Siegel and partner Jim Schwall were standard bearers among the multitude of young white blues artists who exploded on the scene in the ’60s. Corky — originally a sax player who’s also a gifted vocalist, keyboard player, composer and author — and Jim — a guitarist whose background was in country music — met while students at Roosevelt University in The Loop. Formed in 1965, the Siegel-Schwall Band drew immediate comparisons to contemporaries Paul Butterfield, Mike Bloomfield and Charlie Musselwhite and soon became the house band at the historic Pepper’s Lounge, where they hosted a galaxy of blues superstars. Signed to Vanguard Records and later Wooden Nickel, with whom they won a Grammy, they toured nationally before disbanding in 1974. Despite their blues roots, their love for classical music ran deep. They performed the William Russo composition, “Three Pieces For Blues Band And Symphony Orchestra,” with the San Francisco Symphony in 1968, becoming the first blues group ever to enter the world of classical music. The idea was conceived by SFS conductor Seiji Ozawa, who fell in love with Siegel-Schwall during his stints in Chicago, and the performance subsequently appeared as an LP on the prestigious Deutche Grammophon label. Siegel-Schwall reunited for two albums on Alligator in the ’80s and continue to work together on occasion. But both men continued with their lofty pursuits. Jim earned a PhD and became a college professor, while Siegel released two solo blues albums before delving into the blues/chamber ensemble format a decade later. Different Voices is his fourth release in the concept. He’s joined here by Jaime Gorgojo on violin, Chihsuan Yang on violin and erhu, Dave Moss on viola and Jocelyn Butler Shoulders on cello. They’re augmented by Sandeep Das and Frankie Donaldson on tabla, Grammy-winning indie singer-songwriter Matthew Santos, R&B diva Marcella Detroit (aka Marcy Levy), saxophonist Ernie Watts, Blues Hall Of Fame drummer/vocalist Sam Lay and Chicago-based folk trio Sons Of The Never Wrong — Bruce Roper, Deborah Lader and Sue Dumel, all of whom are listed as the “different voices” of the title. Siegel composed eight of the 12 cuts and provided arrangements for the other four. 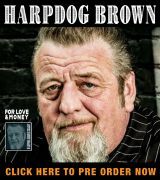 An extended note on harmonica kicks off “Missing Persons Blues — Opus 26,” in which Siegel’s harp trades lines with Watts’ horn as the strings provide a rich, warm, rhythmic foundation. Watts’ closing riffs are stellar. Santos handles vocals with Corky on chromatic on “One,” which sings sweetly of love in Paradise, before Das is featured on the instrumental, “Time Will Tell Overture — Opus 25.” Next up, the strings kick off a sensationally different version of “Lay Down Sally,” delivered vocally by Detroit who composed the original with Eric Clapton. Corky steps to the mike and the strings come to the fore for “Angel Food Cake,” based on a Siegel-Schwall composition, before Santos handles guitar and gets an assist on vocals from Yang on a dazzling new arrangement of his original, “Shadows In The Shoe Box.” Next up, the Sons Of The Never Wrong take command for an interesting version of “I’ll Fly Away,” delivered with an old-time country feel and one of the most successful gospel tunes ever, before the interesting juxtaposition that combines Siegel’s “Italian Shuffle” with the Big Joe Turner jump blues classic, “Flip, Flop & Fly,” the latter featuring Lay on vocals. Three more instrumentals — Hai Huang-Hai’s “Galloping Horses” and Corky’s two-part “Counter Intuitive — Opus 24” — follow before Siegel and Santos share vocals on “The Sky Will Fall” to bring the set to a close. If you’ve got a friend who shies away from the blues, Different Voices is the perfect vehicle to convince them that the roots of the tree have produced quality, classy music that they never could have imagined. 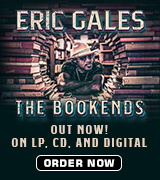 Available through Amazon, CDBaby and other retailers, and strongly recommended.